SVLBI (Space Very Long Baseline Interferometry) is an extension of the ground-based VLBI into the space. It has some important potential applications in geodesy and geodynamics, including the definition, practical realization, and the interconnection of different reference frames, determining the geocentric positions of VLBI stations, estimation of the gravity field of the Earth, and satellite orbit determination using the delay and delay rate observables. The idea of SVLBI was brought forward by N, S. Kardashev in 1970s. More deeper research had been done in 1970s and 1980s. With the launching of the first SVLBI satellite of the VLBI Space Observatory Programme (VSOP) of Japan, in February 1997, this technique has become a reality. An international team of scientists, working under the auspices of the FÖMI Satellite Geodesy Observatory, Hungary, has designed the Geodesy Demonstration Experiment (GEDEX), for the purpose of exploring the feasibility of the geodetic applications of SVLBI. However, several major problems also exist. It is not suitable for geodetic and geodynamic study, which requires precise tracking capabilities resulting in cm orbit accuracy. But the precision of orbit determination is within 10 meters. It is not suitable to frequently changing observing objects. So it cannot provide observations aiming at more radio sources, which are required for geodetic and geodynamical studies. On the other hand, the satellite stopped transmitting observation data after October 2003 and terminated its work on 02:28UT November 11th 2005. Following the success of the VSOP, a next generation space VLBI mission, currently called VSOP-2, is being planned in Japan with international collaboration for a launch as early as 2012. Although there are some obvious defects in VSOP, it is more preponderant than ground-based VLBI. For example, it can provide radio observation with a baseline length longer than the diameter of the Earth to increase observation resolution; also, it can provide all-day VLBI imaging; It has the ability of quick-imaging by the fast movement of VSOP surrounding the Earth; Observation of microscale characteristic is provided by the reduction of u – v empty and so on (SHEN Zhiqiang, 1998). VSOP can achieve more difficult researches with these advantages, such as revealing the fine structures of active galactic nuclei (AGNs). VSOP has achieved its preconcerted mission requirement and has obtained some successes after several years, including: the quick-change of radio source in 1 day can be observed by quick-imaging; north-south resolution is increased obviously; increasing the dynamic range of image (WAN Tongshan, 1999). So VSOP has promoted the development of SVLBI. Based on the successes of VSOP, the science goals for the VSOP-2 mission will place the emphasis on observations in the millimeter wave-band, enabling imaging on the scale of the accretion disk and jet acceleration region surrounding the supermassive black holes in the center of active galactic nuclei, and allow the structure of protostellar magnetospheres to be clarified. Because of the improvement of satellite orbit and structure, such as large deployable reflector (LDR), VSOP2 is more efficient than its precursor. These improvements include: ten times higher observing frequency; ten times better resolution; ten times higher sensitivity; astrometric capability and further sensitivity gains from phase referencing; Measurement of magnetic fields through dual polarization observations and so on. As the next generation of VSOP, VSOP2 makes progress in many aspects. According to VSOP-2 Proposal Abridged English Version, the satellite orbit parameters of VSOP2, such as apogee height and perigee height, are appropriately adjusted by studying the influence of high angular resolution and orbit period caused by high apogee height, the influence of atmospheric resistance near perigee and so on. The adjustment makes VSOP2 more suitable for science researches. The comparison of VSOP and VSOP2 parameters is listed in Table 1. In the following, simulation analyses will be made. 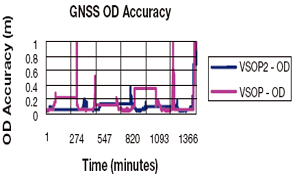 The simulation of VSOP2 in this paper includes: Orbit Determination (OD) of VSOP2 satellite by GNSS, the tracking status of the satellite and the feasibility of connecting observation between the satellite and the observation stations on the ground. During the stimulation, the orbit period is 447.43 minutes and other parameters are invariable. 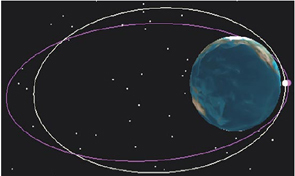 The orbits of simulant satellites are shown in Fig 1, in which VSOP orbit is yellow and VSOP2 orbit is purple. The simulant time is from 2008 1 1 12:00:00 UTC to 2008 1 2 12:00:00 UTC (almost three orbit periods). Sampling interval is 60 seconds.